Poland is planning to replace its obsolete Soviet-built Sukhoi Su-22 strike aircraft with an unmanned strike aircraft (UCAV) system, Deputy Defense Minister Waldemar Skrzypczak told TVN24 television on Tuesday. "We are looking at possibly swapping some of our Su-22 fleet for long-range pilotless systems with high strike capability," Skrzypczak said on the Poland and World program. Skrzypczak has responsibility for defense procurement. Poland plans to buy around 30 UCAVs by 2018 to form three squadrons. Skrzypczak did not say who would supply them. The Su-22, the export variant of the Soviet Union's Su-17M2, was first produced in 1976 and entered Polish service in the late 1970's. Poland is also considering buying a multirole transport aircraft, he said, possibly from Israel, which has experience of converting civil airliners for military use. On paper something like the Mig Skate would be ideal. Low observable, with a 2,000km range and a payload of up to 2 tons, in many ways it would be an unmanned Mig-29 that could use low observable design to fly at medium to high altitudes to maximise range and reduce risk from MANPADS and small arms fire. Of course the Mig Skate is a concept design that likely only made it to full size mockup level. The optimum design will be relatively simple and reasonably cheap. You could treat them like ordinance all crated up till they are needed, with operators practising on simulators and occasionally taking the real thing for a spin. Three seat trainers are popular because it speeds up training if one student makes a mistake then the other student can also learn from that students experience and doesn't have to make the same mistake themselves. Entire classes of UAV pilots can get together and observe each others flight experiences and collectively learn from mistakes made both on the simulator and the real product. They could all be seated behind the controls and observe the actions of the student in control in real time during exercises, which could be recorded and played back for future use. Looking good. Thats the knowledge left from former Soviet Union able to desing. It looks real smooth, but I wonder how the specs match up. Is it a light tank? How many crewmen? Autoloader I presume? Unmanned Turret? Perhaps a fusion of Western and Soviet tank design schools. But one can tell it's only a concept. It draws attention to certain design ideas but I think that as an actual production model it has too much excess and unneccessity. AFAIK there is also no particular reason to build a light tank unless it has some mobility advantage that a heavier tank does not; like say amphibious or air-drop capability, or so that it's light enough to be built on wheels so that it's faster on roads and easier/cheaper to maintain. To make an actual light tank that comes with all the disadvantages of an MBT but only half of its armour and none of the advantages of today's amphibious/air-droppable/wheeled light tanks makes about 0 sense. Which is also a giveaway that this vehicle is simply a concept. Apart from the 'PL-01' written on the side. 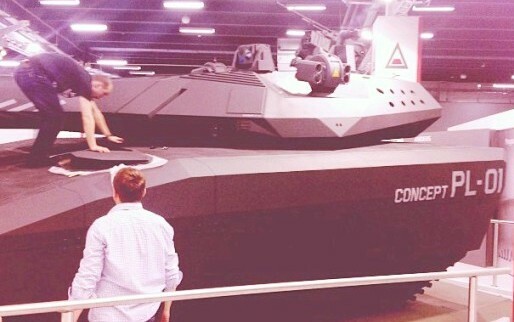 I agree with your post,if this concept does make its way into something maybe only the stealth elements and unmanned turrets and the like would do so. Anyway, IMO poland would be better served by wheeled AFVs. Something like Boomerang-25(a JV with patria makers perhaps) and Typhoon brigades for their army. Poland have many tanks of there newest size in jan 2015 just over 99400. Thinking there are next strongest in Europe. Bigger Army now. Smaller Air Force and Navy. Stronger than Germany in defence. 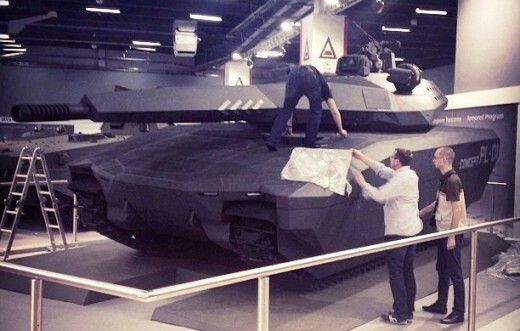 Battalion0415 wrote: Poland have many tanks of there newest size in jan 2015 just over 99400. Thinking there are next strongest in Europe. It probably is actually, especially with their plans for their armored forces & new-gen APCs, ballistic missile & air defense and so on. German & Swedish military capabilities & firepower have completely decayed. France has maintained, Britain has slowly decayed.. but both of those have reconfigured to even more of an expeditionary, and anti-insurgent role than they had during the Cold War. Among the European nations taking conventional warfare seriously - only Poland & Finland.. and Russia & Belarus of course. WARSAW — Poland's Ministry of Defense is planning to launch a much-awaited tender to acquire new submarines in the fourth quarter of 2015, according to Deputy Defense Minister Maciej Jankowski. Under the plan, three new submarines are to be delivered by 2023. Moreover, the ministry is aiming to acquire Tomahawk cruise missiles from the US to arm the submarines, reported local daily Dziennik Gazeta Prawna. "Indeed, we have asked the French and the Americans on the possibility of acquiring cruise missiles for our future submarines," Polish Defense Minister Tomasz Siemoniak tweeted following the report. The long-range Tomahawk is manufactured by Raytheon. No details were available about talks with the French. Jankowski confirmed Poland's plans to launch the submarine tender this year in an official response to a request for information by Artur Gorski, a member of parliament from the opposition Law and Justice Party. The deputy minister said the government did not want to disclose the estimated value of the planned contract, as it could influence its negotiating position. "The ORKA program … is a multiyear program, and its financing will be spread over time until 2024. Indicating an estimated worth of the program would considerably lower the negotiating position of [the ministry] in the planned acquisition procedure," Jankowski said. Deliveries of two submarines are scheduled to be completed by 2022, and a third one will be acquired by 2023, according to the ministry's Military Modernization Plan for the years 2013-2022. As part of the designed contract, a service and maintenance center for the submarines is to be set up in Poland. What's up with NATO members constantly acquiring these old cruise/anti-ship missiles, such as Tomahawks and Harpoons. I realize they've been modernized and improved at a constant rate, but still the designs are 40-50 years old by now. All these subsonic obsolete missiles won't have a chance against Kaliningrad and Leningrad AD. What are the latest and modernized version of Harpoons and Tomahawks usa uses ? My vision for future Poland army will be strong (on paper), but Polish defence industry will be weak! BS . Some citizens of poland embraced the truth instead of ussa yellow press scum and now stupid pole govt calling them an interest group . This shows how sick govt in both ussa and baltics are . Paris a envoyé ses véhicules blindés paient pour rassurer la Pologne et ses autres alliés de l'OTAN En face des ambitions russes. Ceci est un forum anglophone, s'il vous plaît mettez vos messages à travers un traducteur de langue et de les traduire en anglais pour ceux qui sont ici qui ne parlent pas le français va comprendre ce que vous dites. Vous êtes invités à poster en français et en anglais, mais pas seulement en français. Comme je l'ai fait ici. This is an English speaking forum, please put your posts through a language translator and translate them into English so those here who don't speak French will understand what you say. You are welcome to post in both French and English, but not just in French. Like I have done here. No, it does not do it automatically. Some browsers automatically translate text but most do not. Non, il ne le fait pas automatiquement. Certains navigateurs traduisent automatiquement le texte, mais la plupart ne le font pas. According to Prime Minister, Poland plans to invest the equivalent of $3.4 billion over the next 10 years to modernize its naval forces. WARSAW (Sputnik) – Poland plans to invest the equivalent of $3.4 billion over the next 10 years to modernize its naval forces, Prime Minister Ewa Kopacz said Friday. "Over the next decade to modernize the Navy (for the operational program ‘Combating threats at sea,’ we will allocate 13.2 billion zlotys," Kopacz said, as quoted by the prime minister’s official website. Speaking at a ceremony at a shipyard in the northern city of Gdansk, Kopacz said $420 million of the earmarked sum would be spent this year. The investment is part of Warsaw’s commitment to increase military spending on defense to 2 percent of GDP, as prescribed by the North Atlantic Treaty Organization (NATO). The Polish leader expressed confidence that the Kormoran II mine hunting vessel, whose christening was on Friday, "will increase the security of shipping routes and marine training grounds." According to local media, sea trials of the Kormoran II are expected next March and its entry into service with the Polish Navy in November 2016. The prime minister's website said two more Cormorant-class mine hunters are expected by 2022. Pit Radwar (formerly Bumar Elektronika) has been selected by the Armament's Inspectorate of the Polish Ministry of National Defence (MND) to engage in exclusive negotiations for the acquisition of its Poprad short-range air defence (SHORAD) system for the Polish Army. MND spokesperson Colonel Jacek Sota on 26 August said that a contract for about 77 Poprad systems - in addition to two earlier Poprad tests systems acquired in 2014 - is expected to be signed this year, in accordance with the Armed Forces Technical Modernization Plan 2013-22. Based entirely on Polish technology, the Poprad is a self-propelled anti-aircraft missile system designed to engage low- to medium-altitude air threats.